31 points can be awarded to your webstore account (see FAQ). This body style the best selling 1/2" mount cartridge around. A quality brand name has made this available as solid entry level replacement. It will get that old turntable up n running quickly. The same cartridge has been sold with and as original equipment across dozens of brands for decades now. Rest assured if a search has brought you here, this is thee most reliable entry level solution for 1/2" mount turntables regardless of the brand. The corresponding needle that it comes with is our stock #211-d6T (see below) one of our top 3 products. Because this cartridge is mounted on the headshell with two vertically mounted screws, side by side, 1/2" apart, it is known as a 1/2" mount cartridge. Other mounting characteristics are that it has 4 exposed wires in the back and is almost never found on a linear tracking turntable. The headshell is the hardware attached to the end of the tonearm that is usually distinguished by the 'handle' that sticks out to the right for lifting the tonearm over to the record from the rest position. If your turntable is linear tracking it means the whole tonearm slides several inches from side to side as opposed to the standard type usually designated 'straight' or 'S shaped' which pivots on a stationary 'hub' assembly at the right rear corner of the turntable. A linear tracking turntable will generally have buttons you must operate to move the tonearm and will almost always be found with a (T4P) Pmount cartridge. (Go back up one category and click on Pmount). Often people think they must have a brand of cartridge that matches their turntable brand. This is totally unnecessary and often impossible to achieve these days. In fact, the vast majority of turntable manufacturers, had a third party cartridge manufacturer make the cartridge on their behalf. 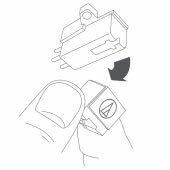 Also, cartridge wiring connections usually go straight to your amplifier, receiver or computer thus allowing the turntable to make no direct electrical changes to the cartridge output signal. a very good product. smooth responce from bottom to high. will work on any tt. i have 5 of them. they are excellent. good output. i have one on my d.i.y tt. and it just plays so loud and full. good design of the stylus. very nice. a beginner cant go wrong with the at3600cf. I bought this unit to re-birth my turntable & I am VERY happy with the result! Sound is crisper & clearer than before & combined with a new belt the overall music experience is much improved. I recommend this company that can help with many products for many brands! This cartridge revived an old Sanyo turntable. I can now listen to my dad's original Chicago albums. The turntable needle is wonderful. It arrived sooner than expected and fit correctly. It helped to make my turntable play records as needed. The cartridge works perfectly on our Realistic LAB 340. I had a question about whether or not this was the right cartridge for our turntable so I called customer service and was very impressed with their response. The representative I talked to was extremely knowledgeable and helpful. Thanks! I took a chance and bought the cartridge and needle since my player was really old. That was the right thing for me plus the cost was very reasonable. Arrived in the mail on time. The cartridge and needle were packed real good and I had no damage when it arrived. Worked great. I received the item 4 days after it was ordered. I spoke with the salesman to ensure I was placing the correct order to match the parts from a 40 year old turntable. The assistance was much appreciated. The part works perfectly. GREAT SERVICE, FAST DELIVERY!! Great cartridge. High quality. Good value. Great sound. The stylus fit perfectly! This model is a perfect match for my turntable. I was not looking for an original piece so this is great. Service was excellent. I received my item in a very timely manner. I will be happy to do business with this company again. Thank you. This needle was EXACTLY what we needed to get our old Sanyo turntable working. I was so excited when we got it and was glad we upgraded for $4.50. The installation was so simple and the sound is great. I couldn't wait to play my old records and will order again from Turntable Needles when the need arises. Oh and the item arrived very quickly which was a nice surprise! Thanks guys! I opted for the Genuine Audio Technica cartridge for just $6.00 more. It was a perfect fit on my Kenwood KD12 RB. I had it mounted in no time and granted its not a $150.00 cartridge, it sounds great! I look at it as for just $28.00, I got my ole' Kenwood Turntable working great again... definitely well worth the money! I've ordered several times from TurntableNeedles.com and have been totally happy with my purchases. Good needle. Works perfect. Instructions were great and included replacement mounting screws. Cartridge arrived promptly...fit exactly.....and works well. Used on a 40 year old turntable. Good reasonably priced option. The part fit perfectly and works just like new again! Great service and fast shipping. I will use Turntable Needles.com again and recomend them to all my friends and family!! This item filled the bill perfectly for me. My previous needle needed replacement and the end result (after consultation with a Turntable Needles technician) was a need to replace the complete cartridge. I am once again up and running with my record player. Works as advertised. The find my needle tool was really helpful in identifying this for an old Aiwa turntable. I bought this with 'JUMPERS Turntable Headshell Wireset' and it was simple to put together. Works Great ! Instructions and mounting screws too. EXCELLENT SHIPPING TO CANADA ! Recommend ! Needle arrived perfectly packaged and safe. Sounds great.. I was having big problem finding a replacement cartridge for my Sony turntable till I came to Turntableneedles.com.. I left a message as to what I needed and got a quick response. Suggestion was AT3600 cartridge. Purchased it, got it in a few days later and now have a awesome sounding turntable. Thanks for everything during this purchase. I am very satisfied with the replacement cartridge I ordered the people are very helpful the whole transaction, ordering shipping etc. was all on time as promised. I would order from them again. Most of all I am happy that I can play my records again. Arrived very fast, attached to clear installation instructions. Quality is excellent as well. It was a pleasure to buy at this store. Thank God I Found TurnTableNeedles dot Com! Well....it had been MANY years since I had pulled the turn table out and reconnected the stereo so my son could enjoy listening to vinyl. Of course, the needle on the turntable was hosed...so I frantically looked...Lo and Behold...TurnTableNeedles dot com had the product needed...(was easy to find it) and were able to expedite the product (which worked GREAT)! Thanks!!! Excellent quality, good installation instructions, and very speedy shipment! I'm hearing certain orchestral nuances from instruments of the orchestra, that I hadn't heard before. (even 1960's recordings in the classics) Very pleased! Received the needle quickly. It came with instructions and worked well. Good value and good service. IT WORKED REALLY WELL. THANKS FOR A GOOD PRODUCT. We know nothing about vintage audio equipment, but were asked to help a friend who has NO COMPUTER (! )source a replacement stylus for his record player. At first we found a similar stylus on a UK website, but then we lost the original cartridge, so had to search again for a cartridge AND stylus. Found this one in the US and ordered it. The friend has contacted us to say he is now happily listening all day to his old vinyl! The Magnetic Cartridge arrived and I installed it in a matter of just a few minutes. When I turned the player on I could not believe how good it sounded again. My wife is pleased beyond belief after having to listen to her favorite records with poor sound quality for such a long time she now enjoys the music like new again. Elvis lives again. The cartridge brought my 1970's Pioneer back to life. I would recommend your business as the place to go for equipment to repair older model turntables. Quick shipping - product as described and worked correctly. Great Value - Great Transaction. The part came quickly. It installed easily. It works great. First of all, I was amazed at how fast this cartridge came in the mail for me. I ordered it on what I believe was a Friday and somehow over the weekend, it still made it to my door by Monday. In regards to the most important part, the sound, for me it has great tone. I'm probably not what you would call an audiophile, but for the price I paid, the part performs to expectations. Item as descibed, and has EXCELLENT Sound. Way faster shipping than expected. My (and your) one stop shopping to relive our Vinyl. A friend gave me an old BSR McDonald turntable that needed a new needle. I purchased this cartridge and replaced the one that had been added to the system. It all works great now. This cartridge was easy to install. Thank you for your prompt response! I received my package on the 12 Sept. The cartridge is what was needed and its working great! It's awesome to be listening to my LPs again. Fantastic sound reproduction. Thank you once again! I have recommended your site to all my friends. Finding the item needed was very easy. Received the part quickly and it is working great. I am playing old Disney records for my grand kids. My overall experience was easy. It only took a few moments to find my desired item. It was promptly delivered and delivers a quality sound. Thanks for a great site & service. This item came earlier than I expected. I was soooo excited to get it onto the arm of my turntable and listen to old records that, to my surprise, my teenagers enjoyed with me! Since I am sometimes skeptical to order from a site I am not familiar with, I was not sure how the service would be, but I have to say I would not think twice to order from Turntable Needles again! Signed, A very happy customer! This is the equipment that came standard on my Denon turntable. I have tried a couple of more expensive cartridge/stylus combinations and yes, I do hear a slight improvement in sound quality but they have also caused records to skip that have never skipped before. The sound from this basic AT3600 and original stylus is really quite good for the price and no skipping! I purchased this needle with the guidance of some of the techs at this site, I received it in a timely manner and even though it is inexpensive I am very pleased with how easy it was to install and the sound quality. I was replacing a needle from a 30 year old turntable so I was a little skeptical but I am very happy with my purchase and the service. Q: Are each of the pins color-coded? Does it fit a Rotel RP-6400? I do believe your unit can use any half-inch standard mount cartridge. Q: Hello. Will this cart/stylus combo work on Pioneer Centrex KH 7766? Thanks for your time. Q: Will this fit a JVC L-A100?